Most Laptop Repair & Recovery Completed Within 1 to 24 Hours! Trilogic are specialists in data recovery, password removal, laptop repair & Apple repair, from a power connector fix to motherboard component change. Beware companies offering a fixed laptop repair cost as all faults are different! Trilogic will quickly give you a FREE QUOTATION before undertaking any notebook, laptop, PC & Apple repairs. Just call in the shop (we open at 8.30am mon-sat) with your Laptop, PC or Tablet or complete the enquiry form, or telephone us now for immediate help with laptop, PC or tablet repairs. There are several different types of passwords used on computers. 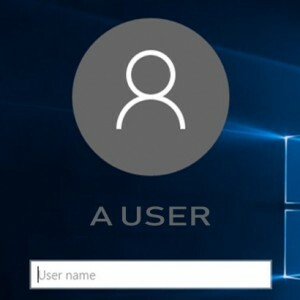 Bios passwords prevent the initial start-up of the computer. Hard drive passwords prevent any access of the hard drive. Windows passwords prevent Windows from opening. Generally, Windows passwords can be cleared the quickest; usually within 1hr. Bios passwords typically can be cleared within 1hr to 24hrs. Hard drive passwords take considerably longer and often cannot be cleared. NO CLEAR NO CHARGE. We can typically recover data from a defective computer hard drive; often in 1 – 2 hrs, however this does depend on how much data is to be recovered and how badly the hard drive is damaged. Recovery can in certain circumstances take more than 7 days. We will only charge you if data can be recovered; we will give you a quote before proceeding. 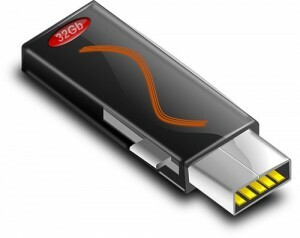 We can recover data from USB RAM sticks, usually in 1 – 2 hrs, however the success depends largely on the exact model of stick and how it has failed. NO RECOVERY NO CHARGE. Power Connector Faults frequently occur resulting in no or intermittent charging/operation; often you can wiggle or wedge the lead to get the power charge light to illuminate in the laptop.We do NOT usually use the manufacturers’ original laptop replacement as it will usually fail again after a short time. We use a nut secured replacement that solidly mounts inside the case. The strain is taken by the case rather than the delicate motherboard. Motherboard Faults are very common, Trilogic, unlike most other repairers fix 75-80% of motherboard faults at an economic price. Many laptop problems are caused by faults on the motherboard rendering the laptop or notebook unusable. We fix motherboards by diagnosing and replacing defective motherboard components where necessary.Fixing a motherboard is considerably less expensive than replacing the complete motherboard, thus keeping the laptop repair cost down! 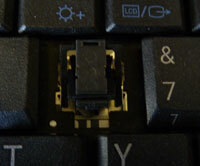 Keyboard & mouse pad faults do not usually occur unless the keyboard has been abused with excessive force or fluid has been spilt between the keys. The usual symptom is one or more keys do not work or require excessive force. The only fix is to replace the keyboard. Occasionally, motherboard faults develop that prevents the keyboard from working.The price of almost every make and model is different, so we need full details. Mouse pads often fail or become ‘sluggish’ & may need replacement. Broken cases may not stop your laptop working but look awful! We can replace most cases; be it the top or bottom or both parts. We do, however, have considerable problems obtaining certain units from some manufacturers who do not make them available. If unobtainable we will offer you a clean second user case replacement. When replacing hinges it is always best to have both hinges replaced as the tension often varies between old and new hinges which could cause the screen to distort during opening. Fluid spills will severely damage your laptop! If you have an accident immediately remove the battery/power lead and invert the laptop to remove as much fluid as possible. DO NOT TURN ON THE LAPTOP!! Send it immediately to us so we can take it to pieces and investigate where the fluid has gone. It is VERY IMPORTANT that you DO NOT turn on the laptop, or it will very likely be damaged beyond repair; it may work for 5 mins but the fluid and electricity will severely corrode the motherboard. DVD/CD ROM drive faults occur very frequently. Great care must be taken when inserting/ejecting the media as often the tray rails become bent or the optics are damaged. If this has happened the unit must be replaced. 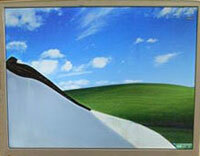 An exact replacement is necessary for laptop repair as the front facia must match. Sometimes the connector from the drive to the motherboard fractures, so the fault is not always the drive.We can quickly repair both types of fault. Hard drive faults occur quite frequently, especially if the laptop has been banged or dropped whilst turned on. The first you may notice is that Windows will not power up properly or there are frequent software crashes. Often errors can be corrected, but it may be necessary to install a new drive and either copy data or reinstall Windows.Trilogic Bradford West Yorkshire shop offers a data recovery service, if your hard drive has failed or has been damaged please contact us for further advice. Viruses, Trojans & Adware or damaged Windows almost always cause the laptop to run slow with frequent crashes. We can either remove them or reformat the complete laptop by reinstalling Windows. By reformatting the drive all data will be lost but the laptop should become as fast as it was when first purchased. We are additionally able to copy say My Documents etc before reformatting so some of the data can be recovered.We can reinstall Windows back onto your laptop even if you have lost all your setup disks providing the original CD Key label is still attached to the laptop. Once reinstalled we will usually restore the drivers and add a virus checker.